Observations of the rising and setting of the constellations in the night sky were recorded as early as 1645 BC by the priest-astrologers of ancient Babylon. They served not only to mark the progress of the year, but as important tools in the priestly work of divination. Some time later, around 550 BC, the Babylonian zodiac was changed to be divided into twelve equal segments. 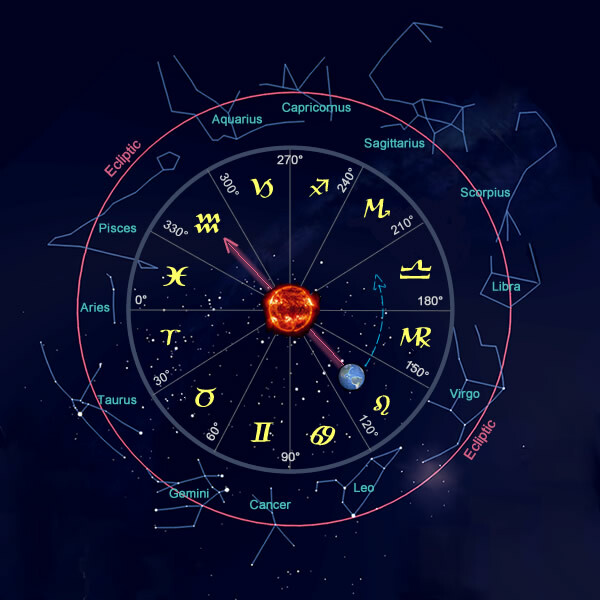 Although this concept went through several evolutions as knowledge traveled through the Egyptian, Greek, and Roman civilizations, it is still used as the basis for Western Astrology today. As the earth moves around the Sun, it travels along the same path, year in year out. This path is called the ecliptic. The ecliptic is the plane in the sky on which the sun, moon, and planets travel. A plane is just a flat or level surface. From our vantage point here on Earth, when we look at the Sun we are always looking across the plane of the ecliptic, like looking across the flat surface of a CD towards the hole in the center. Far out in space, past the orbits of all the planets, lie the stars of the constellations. The constellations, however, do not match up exactly with the Signs of the Zodiac. The constellations range in longitudinal size from 14º (Cancer) to 47º (Virgo), whereas the Signs are all of equal size...30 degrees. Wherever the Earth is along its path around the Sun, one of these signs is behind it. The Sun always appears to be in front of the opposite sign, obscuring it from our view. And so, we say that the Sun is "in" that sign.